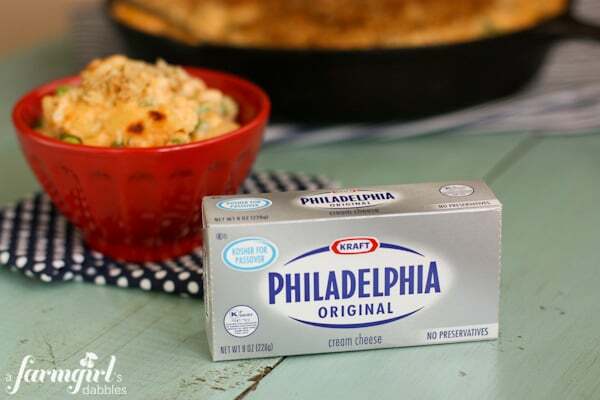 So when PHILADELPHIA cream cheese recently asked me to partner with them, I knew just the dish I was going to gussy up for my family with the fabulousness of cream cheese. You got it…macaroni and cheese! I’ve been adding peas to my macaroni and cheese for what seems like forever, so I knew I wanted them to play a part in this skillet of yum. 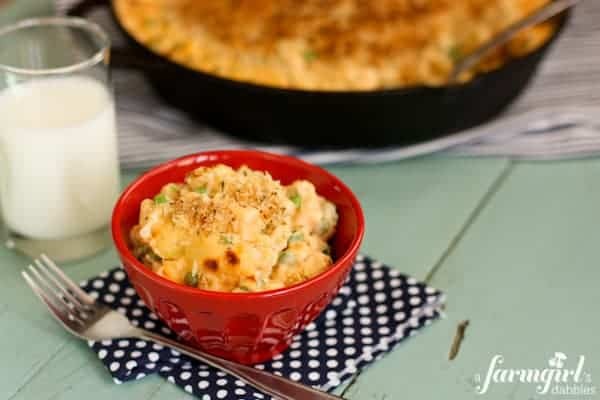 This dish of Creamy Macaroni and Cheese with Peas is rich and flavorful from a homemade cheese sauce that starts with butter and sautéed onion and garlic, and finishes with a thick and creamy mixture of cream cheese, sharp cheddar and Colby-Jack. And then it’s topped off with a contrasting crunchy and super delicious panko crust, oh my! It’s fabulous!! Disclosure: I was selected by Kraft Foods to be an ambassador for PHILADELPHIA cream cheese. I was compensated for my time to share the “6 Days to Delicious” video and PHILADELPHIA’s partnership with Share Our Strength and their No Kid Hungry® campaign. This recipe and all opinions expressed are my own. I’m no stranger to PHILADELPHIA cream cheese. It was in Mom’s fridge as I was growing up, and has continued to find a place in my shopping cart throughout my life as well. If you search my recipe archives, you’ll find numerous recipes using cream cheese. It’s a super versatile ingredient that my whole family loves! To showcase these standards, PHILADELPHIA created a short video titled “6 Days to Delicious” – the graphics are colorful and fun, and the tune is catchy, sure to get you humming. It takes only a minute to watch, please check it out! PHILADELPHIA cream cheese is proud to partner with national child hunger charity Share Our Strength and their No Kid Hungry® campaign, helping to put an end to childhood hunger in America. The No Kid Hungry® campaign connects kids in need with nutritious food and teaches their families how to cook healthy, affordable meals. The campaign also engages the public to make ending childhood hunger a national priority. For every share (via facebook and/or twitter) of the “6 Days to Delicious” video, PHILADELPHIA Cream Cheese will donate $1 to Share Our Strength’s No Kid Hungry campaign, up to $50,000. $1 can help connect a child with up to 10 meals. Gifts made to Share Our Strength and the No Kid Hungry® campaign represent a gift to Share Our Strength’s organizational mission and will be used to reach the highest number of children facing hunger in America. Share Our Strength® does this by combining gifts to address child hunger community by community, state by state. With your help, PHILADELPHIA’s donation today will leverage the time, expertise, and additional funds needed to end childhood hunger once and for all. PHILADELPHIA also supports Share Our Strength through additional program initiatives such as Taste of the Nation and the Great American Bake Sale for No Kid Hungry®. Please take a moment to watch the “6 Days to Delicious video”, and then share it via facebook and/or twitter. Thank you for your help in ending childhood hunger in America. Disclosure: I was selected by Kraft Foods to be an ambassador for PHILADELPHIA. I was compensated for my time to share the “6 Days to Delicious” video and PHILADELPHIA’s partnership with Share Our Strength and their No Kid Hungry® campaign. This recipe and all opinions expressed are my own. To read the full disclosure of this site, please go here. In a medium skillet over medium heat, melt the butter. In a small bowl, combine panko, garlic powder, onion powder, salt, and black pepper. Add panko mixture to melted butter and stir to coat. Cook, stirring frequently, until the bread crumbs are fragrant and light golden brown. Remove from heat and stir in parsley. Let cool. Preheat oven to 375°. Coat the bottom and sides of a large cast iron skillet (mine is 12” diameter with 2” high sides) with 1 tablespoon of the butter. Set aside. In a large pot, bring a good amount of salted water to a boil. Add pasta, stir, and cook just until it is barely soft, about 6 minutes. Drain the pasta into a large colander and top with the frozen peas. Fold the pasta and peas together in the colander to 1.) stop the pasta from cooking and 2.) thaw the peas. Let sit while preparing the cheesy sauce. Return the same large pot to the stove top over medium heat. 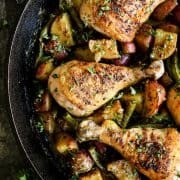 Melt the remaining 5 tablespoons butter, and then add onion and garlic, stirring regularly until onion is softened, about 3 to 5 minutes. Whisk in flour and cook, stirring constantly, until golden, about 1 minute. Whisk in milk and chicken broth and continue to heat, stirring frequently, until the mixture bubbles and thickens slightly, about 10 minutes. Remove from heat and stir in dried mustard, cayenne, salt, and black pepper. Then stir in cream cheese, cheddar, and Colby-Jack, whisking until completely melted. Taste and season with additional salt and pepper, if desired. Add the drained pasta and peas to the cheese mixture and stir to combine. Pour pasta, cheese, and peas mixture into prepared cast iron skillet. Sprinkle the crunchy topping evenly over the top, leaving a 1” border without topping around the perimeter. Bake 25 to 30 minutes, or until sauce is bubbling and the bread crumbs are golden brown. For a blistered cheese effect and extra crunchy topping, place skillet under broiler for a bit to finish it off. Here are a just a few more of my family’s favorite recipes that use cream cheese! This looks so good! Anytime you add peas I’m all in! I love that this has cream cheese in it!! 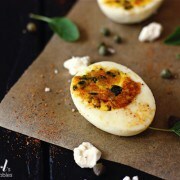 What a fun recipe and great use of Philly Cream Cheese! Hi Brenda! This looks awesome- perfect any night of the week! Fabulous cause and fabulous recipe, Brenda! I love a good mac & cheese. I bet the cream cheese is amazing in this! 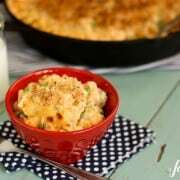 oh my gosh, I thought I was one of the only ones that loved Macaroni and Cheese with Peas!! This looks great! 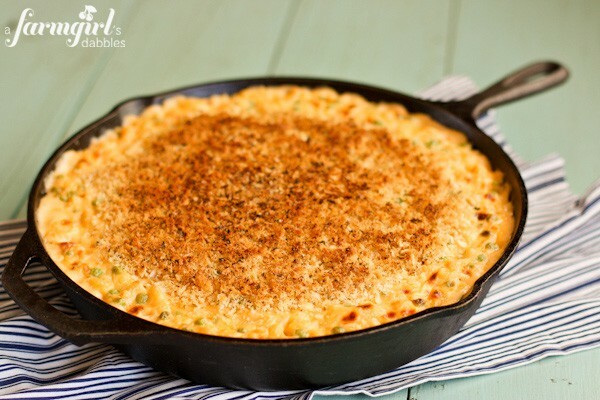 That crunchy top on a mac & cheese dish looks perfect! Macaroni and Cheese is one of my favorites! This looks yummy! So great to see that you partnered with Philadelphia on this campaign as well. Such a great cause! And this is such a mouthwatering mac ‘n cheese, too! I would fit right in at your house. Mac and cheese is my favorite. Oh my word. Cheese, sweet peas and crunchy top?!? I’m coming over….. This looks like the best mac and cheese. I love your additions of peas and Panko! And I’m such a fan of Share our Strength. So cool to be a part of this! Peas with macaroni and cheese is definitely a favorite in our house as well. I’ll have to try this new version soon! I am all about the crunchy topping!! YUM! 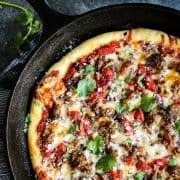 This recipe made me crazy happy! We grew up adding peas to our boxed mac and cheese. I love a more grown up version. I always love macaroni and cheese and nothing beats homemade! Your photos are beautiful…as always! I want to dive in face-first! I absolutely love that crunchy golden topping!